Motherhood is the greatest joy in my life. It is also the hardest job I could ever imagine. I never realized that motherhood would turn me into a major list maker, clock-watcher and unpaid chauffeur. I am constantly juggling schedules and errands so I have to make "To-do" and "Grocery" lists just to keep myself organized. Then, I keep one eye on the clock so I am always on time for all those pick up and drop off times for the kid's school and extracurricular activities. It sometimes seems like my car keys and phone are in my hands at all times. I have two active kids in elementary school. My day is busy from the moment I put my feet on the ground in the morning and there is definitely no time for hitting that snooze button on the alarm clock! My morning is a countdown of minutes where I have to wake up sleepy (not always cooperative) children and get them ready for school. I also have to make time to take care of our four legged fur-kids by walking the dog and feeding the cat. Then I multitask cooking breakfast and packing school lunches for the kids. Time is of the essence to get the kids to school so I rarely sit down to eat breakfast. I just pick at the leftover bits off their breakfast plates as I run out the door. It's not exactly a nutritious way of getting a healthy breakfast to start my day. 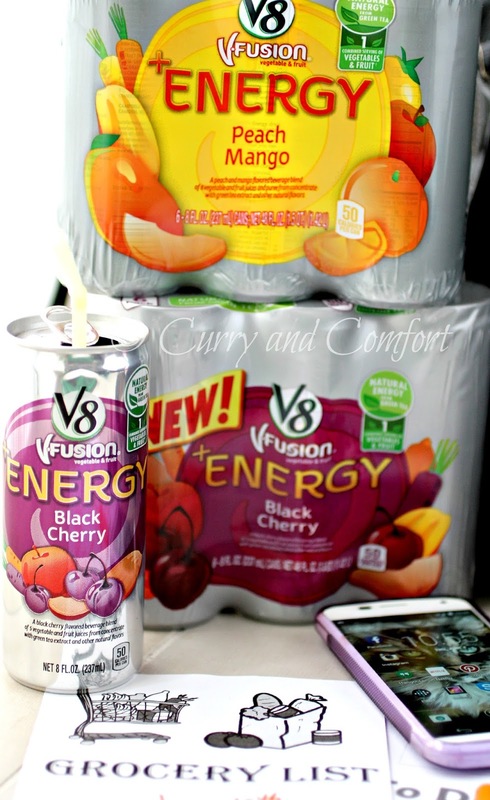 Now, I love enjoying a V8 V-Fusion+Energy Drink as part of a new breakfast routine. All I have to do is pop the top and drink it while walking the kids to school and it gives the needed boost of energy to not only make that walk to school and back, but walk an extra 2 miles (I have a goal of 10,000 steps a day now). 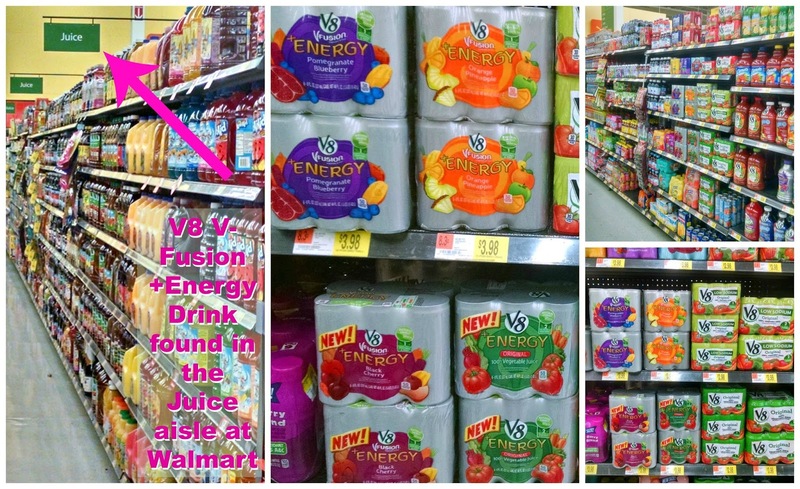 V8 V-Fusion+Energy Drink is conveniently located at Wal-mart . I pretty much go to Wal-mart a few times a week for my household and grocery store essentials. 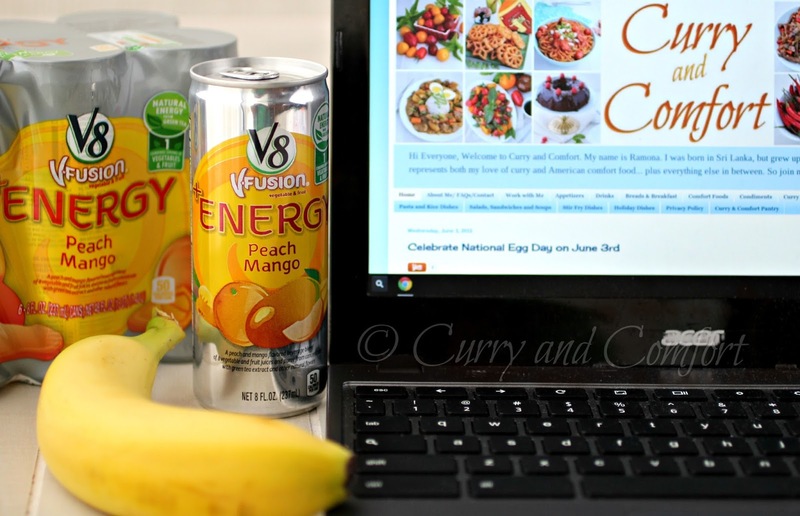 It's easily found in the juice aisle and you will love the selection of flavors. Once I get the kids to school, I spend the rest of my day tackling my "To Do" list of laundry, blogging, running errands, and grocery shopping. Lunch is usually a quick salad, soup or sandwich that I throw together in between tasks. The day whizzes by and I'm off and running again to get the kids at school when their school bell rings at 3:30PM. This is usually when I hit my midday slump. It's been hours since I ate lunch and I am simply tired, hungry and need a boost of energy to get me through chauffeuring the kids from their after school piano lessons and swim practice. 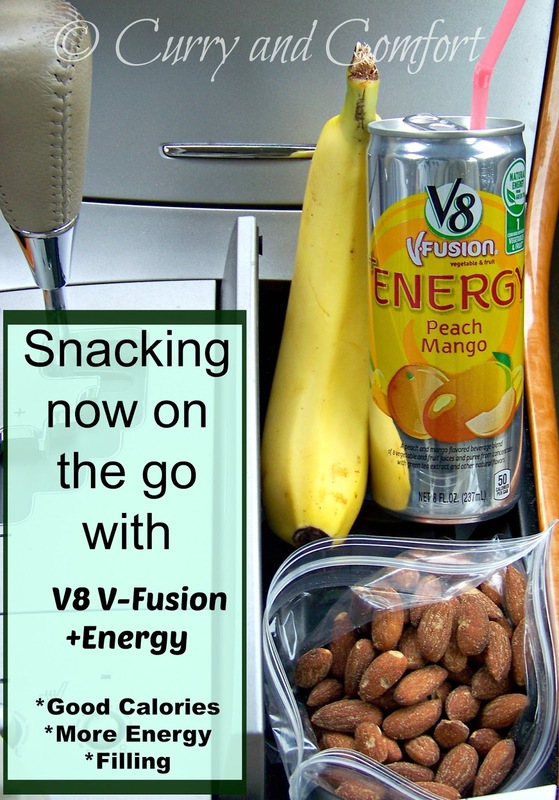 My mid-afternoon snack must also be portable and easy to eat in the car. This is where I seem get into trouble. 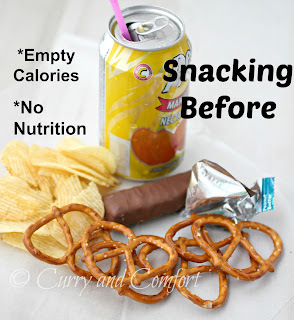 I used to grab whatever "sugary" or "salty" treat I could get my hands on to satisfy my hunger. Of course, that totally backfires because I'm more tired after this kind of snack than before. I also never get the energy boost that I really need to get through the afternoon. 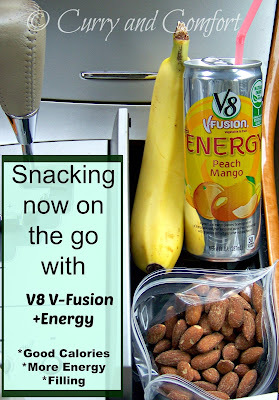 What I needed was a quick and portable snack that was refreshing and full of natural feel good energy like green tea. 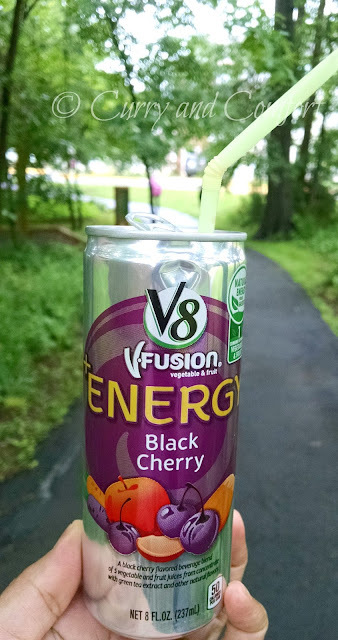 The V8 V-Fusion+Energy Drink is so convenient and I can feel good that I'm getting a combined serving of fruit and vegetables at only 50 calories per 8oz serving. 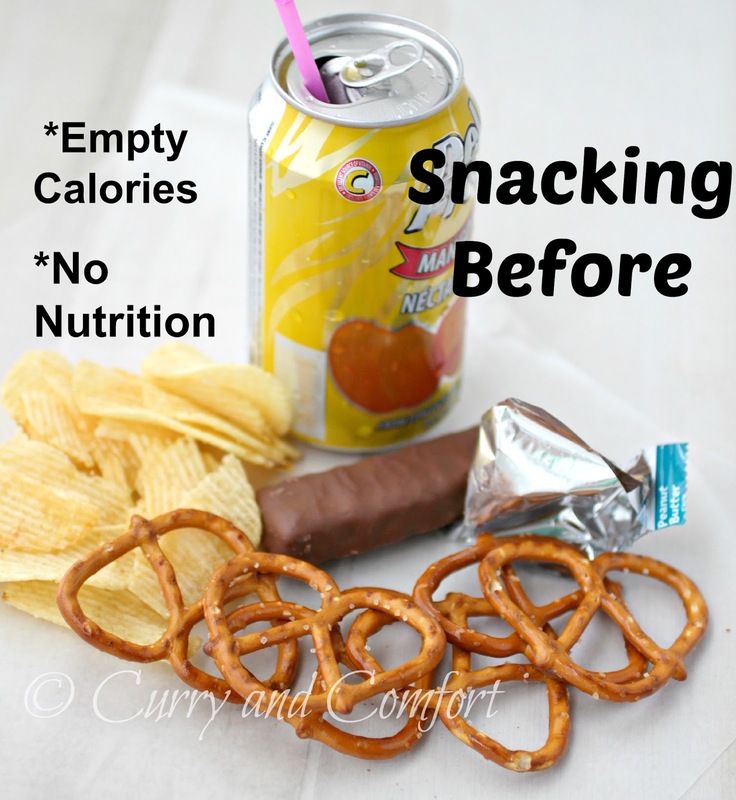 Drinking something healthy also makes me turn away from those empty calorie snacks and I strive to snack a little healthier with a piece of fruit and some healthy nuts. My mood and energy stay on track and I can get the kids home and start making dinner without feeling tired. My life as a mother is sometimes crazy and hectic, but at the end of the day I would not change anything. Now thanks to V8 V-Fusion+Energy Drink I can keep up with my kids and always get my "To-do" list done. 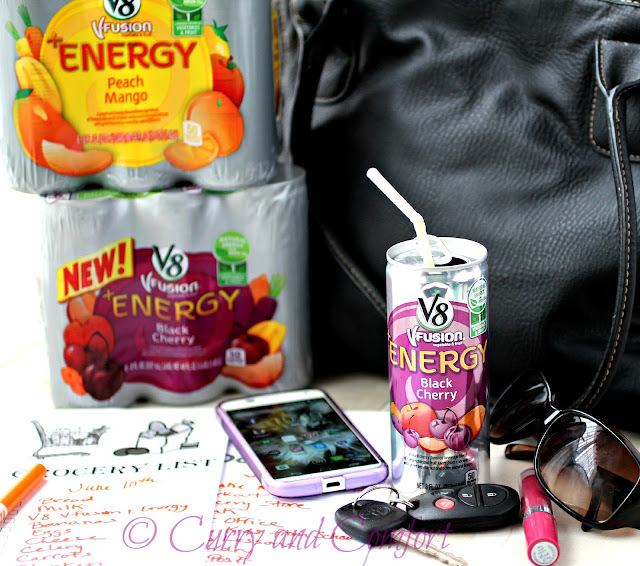 Thanks so much for the review - I have been meaning to try V8's Energy line - I'm going to pick me up some tonight! 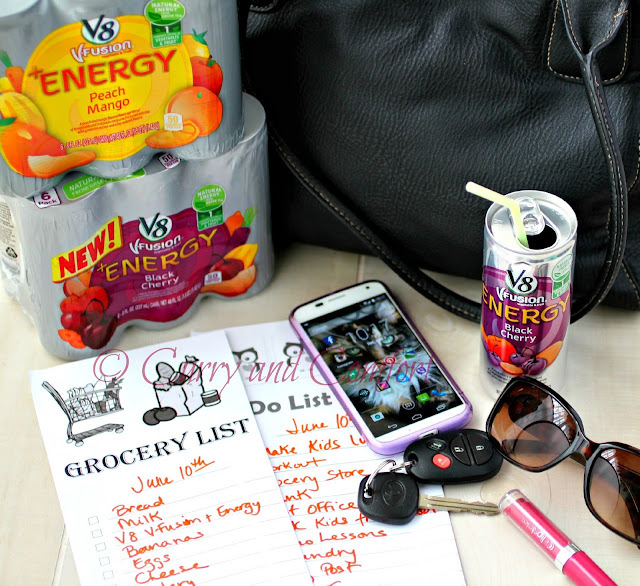 Great post Ramona, I will add some V8 drinks to my grocery list! when one uses the proper tools and software available one can accomplish so much with just a click of a button, and see some great results.